If you passed your driving test after the 1st January 1997 you will need to pass a trailer towing test to get the E category on your licence. This allows you to tow caravans or trailers over 750kg, or a maximum loaded weight of under 3500kg combined loaded weight for the car and trailer. The loaded weight for the car can be found on the vehicles log book and the loaded weight for the trailer or caravan will be plated on the 'A' frame or trailer itself. Without your towing licence you would be restricted to a smaller trailer of up to 750kg. This means that anyone under the age of 34 in 2013 would most likely have to pass this test or anyone that has not held a full car licence for 16 years in 2013. Most people and companies are still unaware of this and are therefore towing illegally, which means they will not be insured. This can result in a driving ban if stopped by the police or even worse, if an accident did occur you personally would be liable for any damages, as your insurance would not be valid. V.O.S.A also have patrol vehicles regularly checking weights and licences. We have our own cars and trailers that meet all the requirements of the D.S.A in size, weight and load for you to use for your training and test. We have fully licensed A.D.I trainers and are one of the N.F.U approved trainers. As at July 2011, we have an 87.5% pass rate, which is much higher than the national average. If you already have a car and trailer combination you that you'd like to use you will have to make sure it meets all the requirements of the D.S.A test centre, otherwise you will not be taken for the test and will lose your test fee. If you plan to us your own trailer then please read the DVLA's Requirements for towing trailers in Great Britain (INF30) Leaflet by clicking here. At our large off road training sites at Pirelli Stadium Burton on Trent and Lichfield Rugby Club Lichfield we can replicate the off road manoeuvres that you will be required to pass for the D.S.A. test, and the coupling and uncoupling of the trailer, without being distracted. Located in Burton and Lichfield we are able to provide trailer training to clients in Staffordshire, Derbyshire, Leicestershire, Nottinghamshire and most of the Midlands. We can provide an instructor and trailer to companies for the session so that drivers can be assessed for their requirements or for group training, we also provide 3 hour one to one training sessions towards the test or just as refreshers. Our 4 and 5 session courses come with a test at the end and are all on a one to one basis unless you have requested otherwise. Click here to visit DirectGov for more information about towing Caravans, trailers and commercial vehicles. The main part of the test is on the road so your normal driving will have to be to a high standard and this will be assessed before any trailer training will be started, and any problems will be addressed. This is considered a professional qualification and the test will be at one of the HGV test centres, in Birmingham, Stoke on Trent, Nottingham, Featherstone or Wolverhampton. Your standard of driving will have to be a lot higher than the normal ‘L’ test. Because of the trailer you will have to demonstrate advanced planning skills and vehicle control on the road. You will be on the road for the exam for approximately 50 minutes. The whole test will take just over an hour and a half to complete. You must show that you fully understand the principles of the reversing manoeuvres and can complete these successfully on site. You will need to perform a controlled stop on site as well as reversing manoeuvres before going out on the road with the trailer attached. You must be able to couple & uncouple the trailer and make all the relevant safety checks . You will also have to answer five B + E safety questions at the start of the test, a driver fault will be recorded for each incorrect answer to a maximum of four driving faults. If you answer all five incorrectly a serious fault will be recorded. We will provide a list of questions for you to revise from at home, also your instructor will go through them with you so you fully understand all aspects as part of your training. 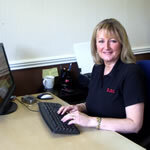 Please phone Janet on 01283 545900 to discuss your requirements. "A great experience all round, especially as I had no prior experience until my lessons! And I passed 1st time-bonus!! Thank You L.D.C"
"I got all the information I needed from the training. It was also made fun and enjoyable. I felt confident for the test." "My instructor was very good, helped me feel confident which helped me enjoy my lessons. I was glad I did my B+E test, and wish I had found L.D.C before! They did all the paperwork and booked the lessons and test quickly. I would recommend them anytime!" "Very good place, nice people. Have recommended to lots of people." "A friendly but professional service with excellent tuition. Highly recommended!" "The training was informative and professional. I Thoroughly enjoyed my training with L.D.C. and passed first time!" "Brilliant, would recommend this driving school to anyone. Les was friendly and informal and made me feel at ease straight away. He never sugar coated anything and if I wasn't doing something right he'd explain what went wrong and why. I hadn't had a lot of experience towing before and defiantly not reversing but after 2 lessons I was reversing like a pro! Would defiantly recommend the individual lessons if you've never towed before. They give you the confidence and the one on one attention that really helps cement in the foundations of what you're doing. The office staff are always friendly and come back to you when they say they will, and I even got chocolate to calm my nerves before the test.....what more could you ask for!!!!" superb experience! I passed my test on the first attempt with lots of confidence. The instructor was professional and friendly, making the whole experience enjoyable. I would strongly recommend L.D.C!!" "L.D.C were excellent throughout my training, offering me support and guidance. I rapidly became confident and am please to say, passed my test first time!" "Everything was brilliant and im really pleased that i chose LDC to take my trailer test. I have confidence now and would recommend LDC to friends and family." LDC have been amazing! Les took me for my B + E with no trailer experience and I passed first time after two sessions! Great bunch would definitely recommend! Please phone the office on 01283 545900 to discuss your requirements.